Many patients facing debilitating or life-threatening diseases are often confronted with unnecessary complexity when searching for relevant information and getting access to a medicine itself. myTomorrows has developed a global treatment database, which provides access to information on clinical trials and Early Access Programs worldwide. Transparency is essential to support data driven treatment decisions, hence myTomorrows has decided to open up access to the database. Transparency of clinical trial information is taking on new dimensions as clinical trial sponsors are facing a host of new registration requirements both in the US as well as in the EU. The increased transparency and use of information from clinical trials offer new data use opportunities as well as operational challenges for industry and academia. Shortly after the United Nations called on governments worldwide to pass legislation that will increase transparency in clinical development, the Department of Health and Human Services in the US responded by publishing the “Final Rule”, which expands the clinical trial information published by the ClinicalTrials.gov database. Starting on the 18th of January 2017 a wide range of changes will come into effect. This will have far-reaching consequences for many stakeholders, including originators, physicians and patients. The Final Rule points to a large increase in the information disclosure requirements for drug developers. Sponsors of clinical trials have to prepare Expanded Access records within 30 days of starting a clinical trial, unless they decide not to make products available for expanded access. In any case, the “status of availability” has to be communicated clearly by the sponsor. 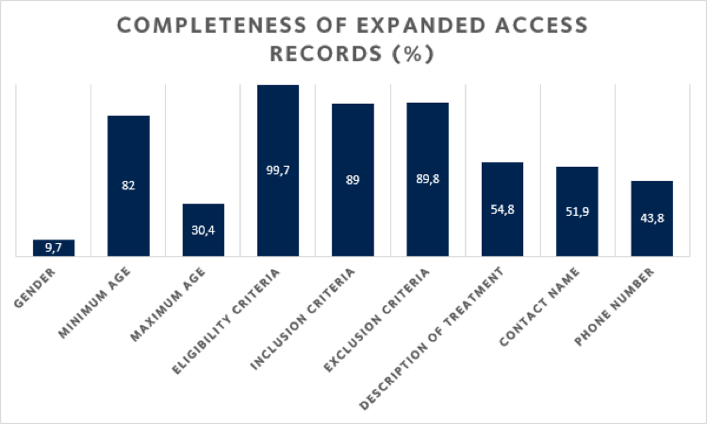 Moreover, Expanded Access Programs have to be registered regardless of size and ambition, meaning that even individual patient programs have to be registered. If a sponsor decides to make a drug available under Expanded Access, a description of the explicit procedure for requesting access to the investigational drug must be made public. This includes supplying basic contact information, such as name, toll-free phone number and email address. As a data-driven company, myTomorrows has developed the leading global Clinical Trial registry and Expanded Access database. 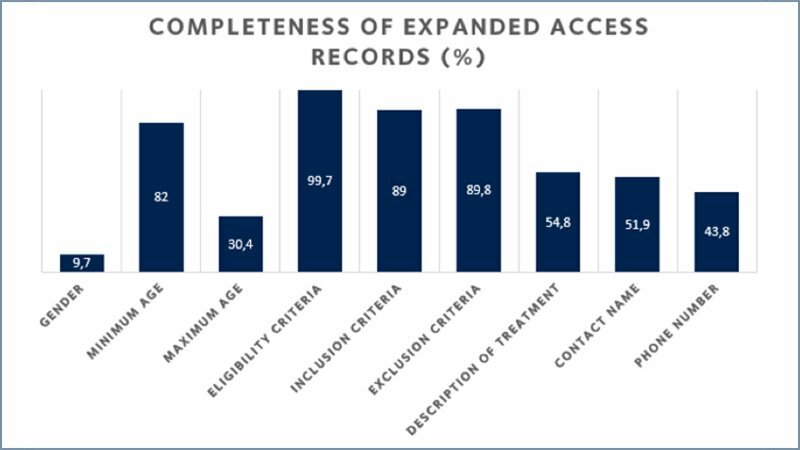 Mining through data on 378 EAP’s within the clinicaltrials.gov registry, still the primary repository for Expanded Access Programs (EAPs) worldwide, we have made a few observations (see graph above). It is clear that patients specifically searching for expanded access criteria related to gender or age will often remain without answers. Should patients find themselves eligible for an EAP, the exact treatment is only described in a little more than half the published records. Further to that, about half the programs listed on clinicaltrials.gov lack basic contact information, leaving patients in the dark in terms of how to engage. The Final Rule is a helping hand to patients without approved treatment options. As soon as sponsors of clinical trials comply with the requirements of the Final Rule, patients will be much better equipped to search for Early Access Programs and apply for access. myTomorrows considers Expanded Access to medicines for patients with an unmet need as an important part of patient engagement, leading to valuable inputs to improve medicine development. With the Final Rule coming into effect in the next couple of weeks, companies are rapidly forced to start thinking more proactively about their Expanded Access policy. The trend of patients and physicians being increasingly equipped with more information as to what treatment options are left is irreversible: these new developments will eventually move the discussion to why not all drugs are available to those facing unmet medical needs and how a drug can actually be accessed.